Something that Elvis, Michael Jackson and John Lennon shared is a retreat from the public, many would even say a retreat from reality, after being swamped by the tsunami of fame. Graceland, Neverland and the Dakota apartment building became their respective hideaways; in some ways, their private prisons. Grief is shared, yet it is also private. Rock stars are public figures, known around the world, but listening to music can be such a personally intense experience that everyone has an individual reaction when a popular musician dies. 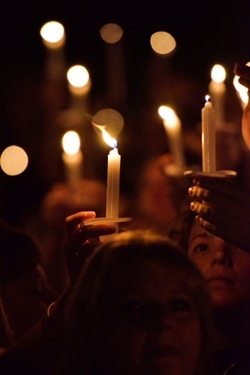 The grieving that follows the death of a famous musician is universal, yet also personal. The funeral for the famous musician stopped the city. Thousands of people packed the streets, sharing their grief and love for the man who was gone. They followed the casket, which was festooned with flowers, and then, together, started singing one of the musician's most popular songs. Never before had so many voices joined in glorious harmony. When did this happen? 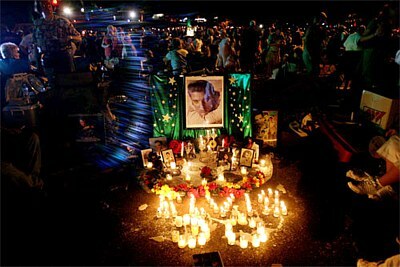 Was this for Michael Jackson's memorial in 2009 or the recent gathering for Blues Legend BB King? Or almost 35 years ago, when shocked crowds assembled all over the world to remember John Lennon? Was it, perhaps, in 1977, 38 years ago today, when people lined Memphis streets to catch a glimpse of the funeral procession for Elvis Presley? In fact it was none of the above. The impromptu singing by the huge crowd occurred in Milan in January 1901 at a public service to honour the Italian composer, Giuseppe Verdi. The song was 'Va Pensiero' (Chorus of the Hebrew Slaves) from Verdi's opera, Nabucco. Similar scenes — again in Milan, though on a lesser scale – occurred 23 years later at the funeral for Giacomo Puccini, when thousands of mourners stood in pouring rain. They love their composers, the Italians. And music, a universal language, can touch people more powerfully than almost anything else. There is a universality to grief, too. 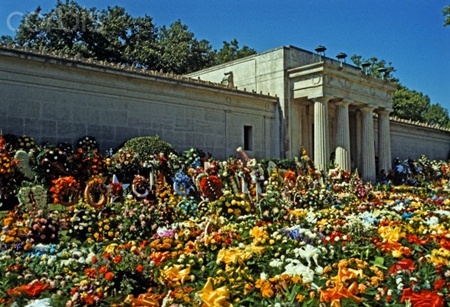 Just as those mourners in Milan joined together to sing one of Verdi's signature tunes, so too in August 1977 did people gather from all over the world at the gates of Graceland to mourn over their lost idol. 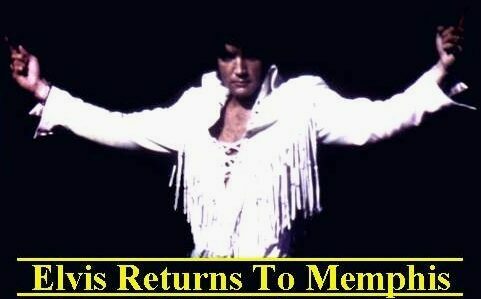 Elvis touched the soul of every true fan and that hot August night in 1977 the fans returned the love. In 1980, the pictures propped up near flickering candles all over the world were of Lennon, and the song being sung was his `Imagine'. So it goes: the musician dies, the music lives on. Indeed, it often attains a hold on the popular psyche that might have been inconceivable without that death. To what extent does the iconic status of Lennon’s ‘Imagine’ or Jackson’s ‘Billie Jean’ rest on the passing of these two great superstars at too young an age? Some fans found it impossibly painful to play Elvis’ last album ‘Moody Blue’ in the immediate aftermath of his death and in 2015 there are many fans who grew up with Michael Jackson's songs forming a soundtrack to their lives. Something has now been wrenched away from them, and it hurts. When Don McLean's 'American Pie' notes of "The Day The Music Died" - what date do people think of? Buddy Holly's plane crash? Michael Jackson's death? or perhaps when Lennon was shot in New York City in 1980? But for the world's largest annual day of "rock'n'roll remembrance" it all started and ended with Elvis. He was The King, there have never been any other rightful claimers to the throne. For those too young to remember the worldwide wakes for Elvis (the incredible amount flowers from fans worldwide) and Lennon, the extent of media coverage following Jackson's death might have seemed extraordinary, perhaps unprecedented. In fact, it followed a familiar pattern: first the newsflashes, then the shock and tributes, followed by an unwillingness to let someone rest without rooting out all details of the death itself. In this regard, the death of Lennon is more shocking than the others. He was killed (shot, as was Marvin Gaye four years later), whereas the later-discovered excessive lifestyle of Elvis and the bizarre lifestyle Jackson, both of whom had substance-abuse problems, doubtless contributed to their deaths. When George Harrison died from cancer in 2001 it prompted sadness and tributes, but to a lesser degree than the murder of his fellow Beatle almost 21 years earlier. The circumstances of a death inevitably influence any evaluation of a life. Because of links with drugs, the premature deaths of Hendrix, Joplin and Morrison now seem wasteful, a kind of pathetic postscript to the swingin' 60s, while the plane crash that killed Buddy Holly doubtless cut short the life of a prodigiously talented musician who, though just 22, still managed to be a hugely influential figure in the history of rock'n'roll. Later, he would say of his own song `Help', which he wrote in 1965: "I knew I was really crying out for help. It was my "Fat Elvis" period... getting old, very insecure." Ironically, he also said that the Beatles initially "had some sort of objective, like being as big as Elvis. Moving forward was the great thing, but actually attaining it was the big let-down". 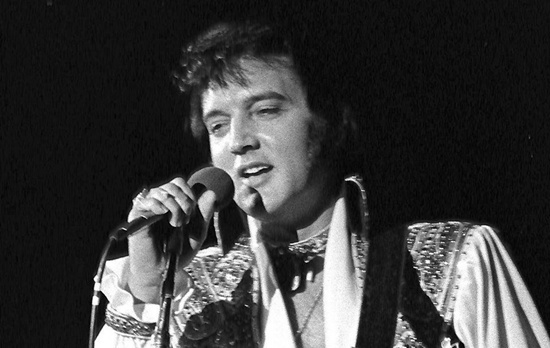 Lennon acknowledged the major influence of Elvis on his musical development. For his part, Elvis was well aware of the rise of the Beatles: there's a photo from the mid-60s of Elvis that shows the King scanning a magazine article about the Fab Four. He looks somewhat concerned, aware that there are pretenders to his throne. Although keenly aware of musical antecedents, Elvis saw himself as unique. "Who do you sound like?" "I don't sound like nobody." Later, of course, there would be a legion of Elvis imitators. Sometimes they seem un-stoppable. Some are good, NONE are ELVIS. Trace the story back, however, and it's impossible to say exactly when the ripples of influence started to spread. 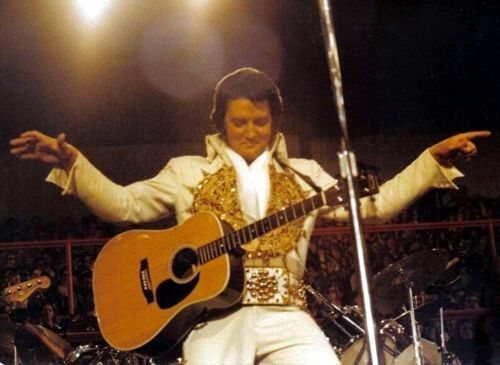 One example: a few years after that first recording, Elvis made a triumphant return to perform near his high old school in Memphis, in front of thousands of screaming fans. One was a teenage girl, Virginia Wynette Pugh – better known, before long, as Tammy Wynette. She would have been struck – just like Jackson fans three decades later – by the way Elvis moved. Aural recordings (which have existed long enough for us to know what Nellie Melba and Enrico Caruso sounded like when they sang together more than a century ago) only tell part of the story, for Elvis and 'Jacko' were both astonishing live performers. "I am afraid I am going to end up like him, the way he did." Perhaps he did; perhaps it's just another story. Something else that Elvis, Jackson and Lennon shared is a retreat from the public, many would even say a retreat from reality, after being swamped by the tsunami of fame. Graceland, Neverland and the Dakota apartment building became their respective hideaways; in some ways, their private prisons. 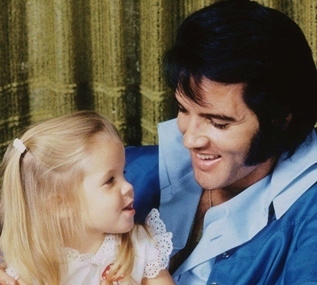 Elvis’ good friend Larry Geller talked about the sadness of Elvis final months. "Elvis did have a plan for the future. Even in that last year when he was really sick and he was taking a lot of pills, Elvis was acutely aware or it. No one knew more of what he was going through than he did. He knew he had a problem & he knew he had to stop. We were going to go to Hawaii and he was going to get rid of most of the people who worked for him and keep a skeletal crew. He was going to get rid of Col Parker. Elvis said, "Man, I want to get off these pills and I want to get a good diet and I want to exercise. I want to come back next year & I want to make movies again. Not those teeny-bopper movies but real dramatic roles and I can show the fans who I really am". He was serious at the time. The tragedy of Elvis' life is that here's the guy that had it all. He was, is, and always will be The King. But he knee; was toxic and that his diet was outrageously bad and that he had to clean up his system. He knew that there were people around who were not his friends but were just there for the pay check. Elvis was smart and smarter than anyone around him. And he was making plans. The tragedy was that he procrastinated." Grief is a personal emotion. Record producer Sam Phillips, a hugely important figure in the Elvis story, also said in 1977: "I will never forget the looks of total disbelief on the faces that lined both sides of Elvis Presley Boulevard for the funeral procession. It seemed as though each person stood completely alone." The story goes that in August 1977, Colonel Tom Parker, the carnival spruiker who became Elvis' manager, took a call in his hotel room from Joe Esposito, a member of Elvis' `Memphis Mafia'. After being told that Elvis was dead, Parker took a deep breath and exclaimed, "Oh, dear God". He then fell silent, before telling his staff: "Nothing has changed. This won't change anything." In many ways he was right. Proof of this can be found on the high wall outside Graceland, where visitors and pilgrims scrawl personal messages. ... Dolly and Manuel Came to See You Elvis! 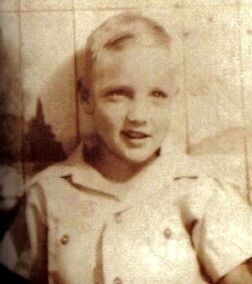 ... Elvis, When I was eight years old I wanted to marry you. Now I'm 30 and still feel the same. 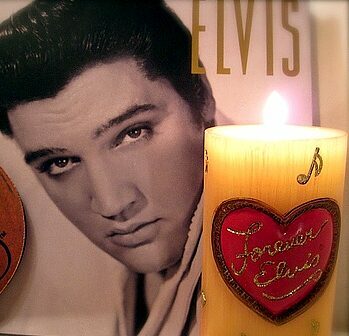 ... Elvis, you are here forever, in my heart you will never die..
.. Elvis, Your Queen Has Arrived. 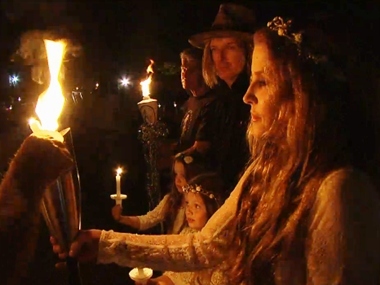 They are similar to tributes penned recently to B.B King, and in the UK for Amy Winehouse, or at gatherings every year on the anniversary of Lennon's death. But an intriguing feature of the Graceland wall messages is that they are not left for a dead man. They are written in the present tense. As if, yes, Elvis lives. 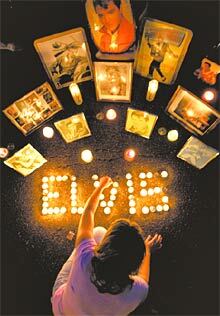 And Elvis will live, Forever. -Copyright EIN August 16th 2015. Do Not reprint or republish without permission. Does Elvis matter? 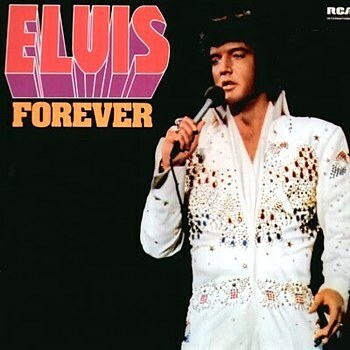 : Is it Elvis that really matters? JAZZWORLD - Music vs. Elvis Presley.